There might be a lot of people in the world willing to pay top dollar for an Android smartphone, but there are plenty of other people who…, well, aren’t. Verizon Wireless is reaching out to the cost-sensitive with the Motorola Citrus, what can be described as an entry-level Android phone that covers all the basics and costs just $49.99 after a $100 mail-in rebate with a two-year customer agreement. The price point doesn’t make the Citrus the least expensive Android-powered handset available—for the moment, that’s the Comet on T-Mobile—but it may ease the pain for users looking to upgrade from a simple feature phone into the world of apps. The Motorola Citrus runs Android 2.1—no word on whether Android 2.2 is in the wings—with a 3-inch touchscreen display with a meager 320 by 240-pixel resolution. 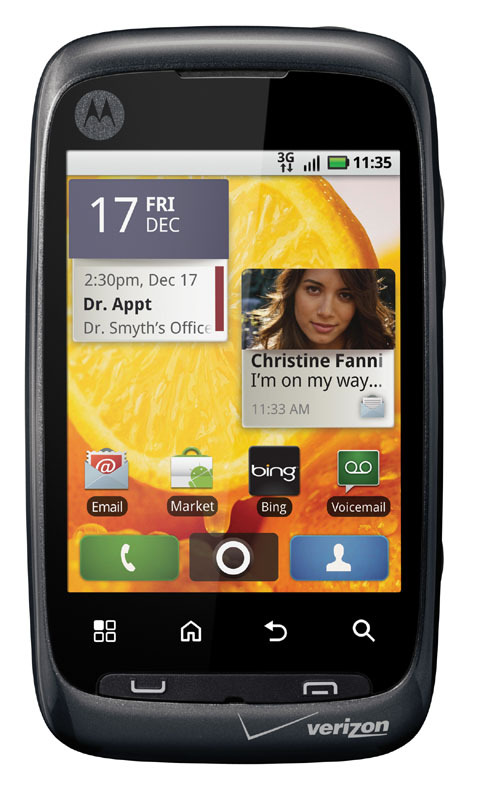 The Citrus also features a video-capable 3 megapixel camera, 802.11b/g and Bluetooth wireless networking, assisted GPS for location-aware applications, full HTML Web browsing and (of course) access to the Android Market, and a virtual QWERTY keyboard for messaging and mail. Motorola touts the Citrus as an eco-friendly phone: the case is made from 25 percent post-consumer plastics, free of BFRs and PVC, and the device is certified “CarbonFree” through an alliance with Carbonfund.org. Of course, folks attracted by a $50 post-rebate price on the Citrus need to consider the cost of smartphone plans: even Citrus customers will need to subscribe to a Verizon calling plan (those start at $39.99 a month) and a data plan (starting at $14.99a month for 150 MB). Over two years, even Citrus customers will be paying Verizon Wireless over $1,300 for service, making that extra $100 or $150 saved up front on the phone seem a little inconsequential. The Citrus might be an ideal phone for some people, but consumers willing to set down that kind of money for a device ought to at least get one they can enjoy.